It is monday. A rainy, grey monday. I am having my second cup of tea, a blanket, a book.. It is just what I need. No rush, no need to go anywhere, no things that need to be done today 🙂 I have time to do whatever I want … that is a pure luxurious feeling. The last days and weeks were busy. I was running around, trying to find an apartment, driving more that 100 km every day in order to get to and from work. There was absolutely no time to sit down and write or to go through my baking books to find the next recipe to try out. I only made some cupcakes and that is it. There are no holidays, no birthdays and no celebrations that would require a cake, so somehow the baking disappeared from my to do list. 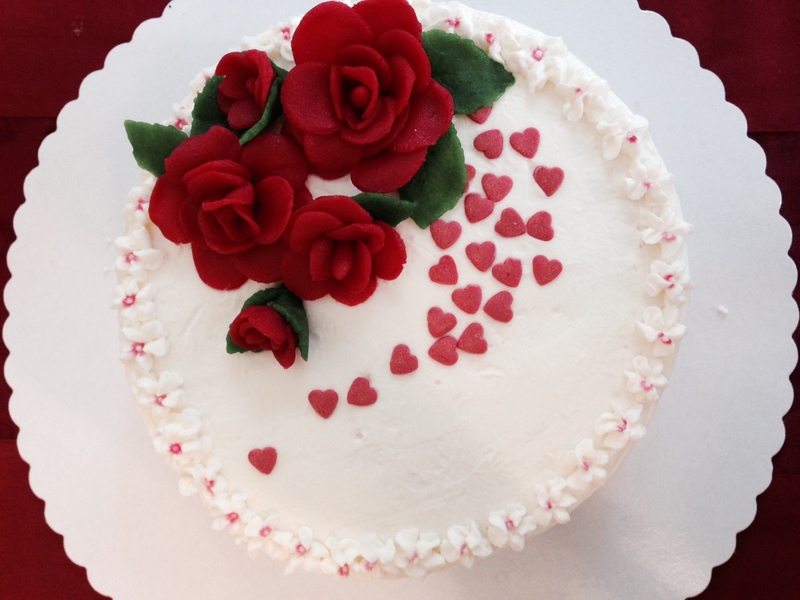 However, there was one day that needed to be honored and thus required a cake – mother’s day. In Germany mother’s day is always the second sunday in may. So a couple of weeks ago I packed my bags and went to visit my mom. Apart from my clothes, I packed a new baking book with new recipes. We decided for a small cake, because only my sister and her boyfriend would join on that day. The cake that we picked was a cherry cake with an almond pudding filling and roasted almonds at the sides. Well, the roasted almonds burned and whatever was left, did not want to stick to the sides of the pan.. I skipped that part. The filling was too runny and only the cherries were ok. I have to admit that I really did not stick to the recipe. I did not want a gooey texture of the filling, so I skipped the gelatine – bad choice.. it sure needs a little. I did not follow the instructions for the batter, but used my own sponge cake recipe – ok.. that of course worked well. All in all, it was ok, but not outstanding. I need to work on that. That is why I won’t post this one in the recipe sections. If you want to try it, use the sponge cake recipe and for the filling make some almond pudding as instructed on the package and add some whipped cream and a little gelatin. Put some cherries on the first layer of the cake, spread some of the filling on top and repeat with the second layer. Put the third layer of the sponge cake on top and cover with whipped cream. Decorate as your heart desires 🙂 I made quick marzipan roses and sprinkled some sugar hearts on top of the cake. 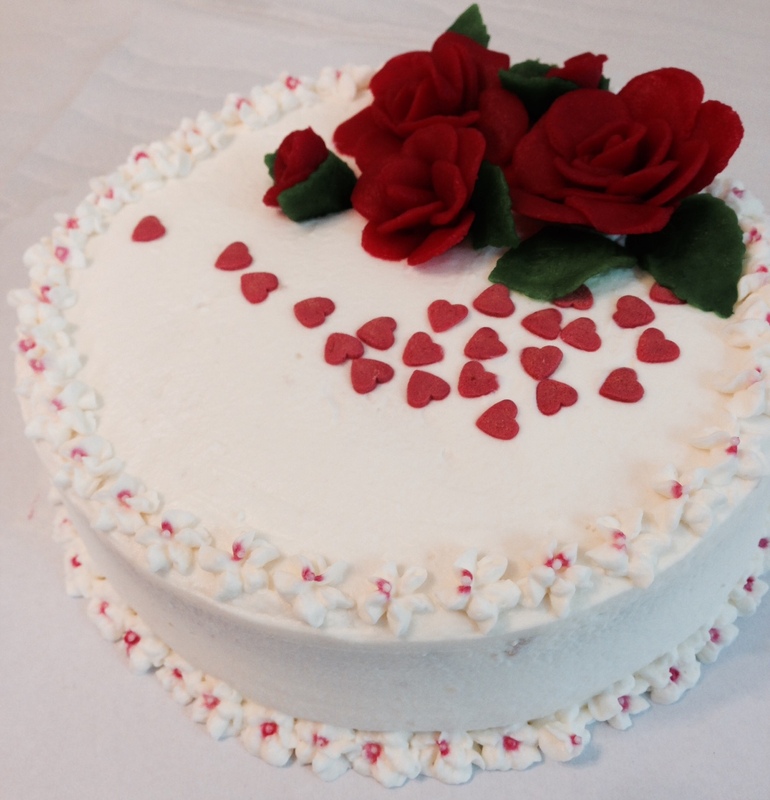 The lower and upper edges I decorated with small heavy cream flowers, which I added a red nonpareil to. Done 🙂 I hope you like the design. Enjoy your monday and the rest of the week.